I guess I will eat any seafood that is served in front of me (except for sea urchin), I love everything about them the taste, the texture, the aroma and the variety. Combine them all together then my jaw would easily drop and my salivary glands would produce its secretion non-stop. It does not matter how its cooked as I think with seafood it’s hard to get it wrong as long as you don’t over season it and use non fresh ones, that is why dishes like Seafood Paella, Bouillabaisse , Zarzuela, Pancit Malabon, Seafood Fried Rice or this post it will always be a champion for me. 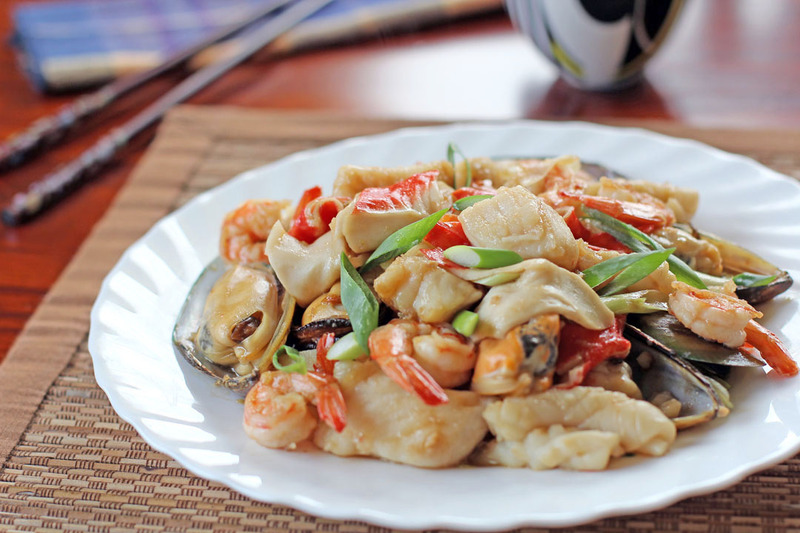 If you are a seafood lover then you should make something like this, it’s very tasty specially when clams are used, the seafood alone packs a lot of flavour adding oyster sauce to the formula makes it stand out even more. Place 2 cups water in a pot then bring it to a boil, once boiling drop mussels and cook until shells open. Remove mussels from pot then set aside. Using the same pot, continue to boil water then add the fish, cook for 2-3 minutes. Remove fish from pot then set aside. In a wok add oil then bring heat to high. Once oil is near its smoking point add squid and prawns, flash fry in high heat for 2 minutes. Remove from wok then set aside. 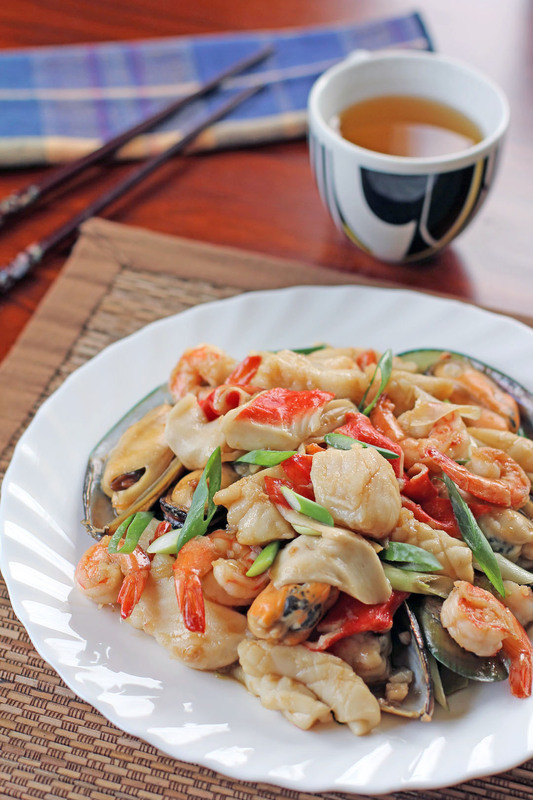 Reserve ½ cup of liquid from the boiled seafood then mix this together with oyster sauce and brown sugar. Set aside. Using the same wok sauté garlic, ginger and white part of spring onions. Add the Chinese cooking wine, cayenne pepper and then the diluted oyster sauce. Bring it to a boil then add the surimi, cook for 1 minute. Add back the cooked seafood, then cook while gently folding for 2 minutes. Add the green part of spring onions then season with salt (if needed) and freshly ground black pepper. Serve. [laughing] I was going to say I would cook the seafood in dry white wine instead of water, but I see the dish does have Chinese cooking wine added at the end, so I better copy the recipe exactly 🙂 ! Could not live without oyster sauce!!! This could easily become a favourite of mine. This sounds a lot like one of my favorite dishes that we’ve made since we were dating. I’m with you – any kind of seafood….and oyster sauce is always a bonus. Delicious Raymund! I adore any dish with seafood…. This sounds really yumm! I am so jealous of all of the wonderful seafood that you have access too! There is no way I would be able to find, much less buy so luscious looking seafood living in the high dessert of the SW U.S. Your dish really makes me miss living near an ocean. It looks delicious! Gosh, what a great looking dish! Love everything you’ve managed to cram into it! Great recipe – thanks. I love all kinds of seafood, including sea urchin and thankfully we have lots here in Sydney. That is a quick, easy and tasty recipe too! Love the use of oyster sauce in stir-fry’s! Yum!